Blues and Brews is a festive night of world class blues, dancing, local craft brews, wines, food and more to honor and celebrate our Veterans, Active Service, and Fallen Warriors. 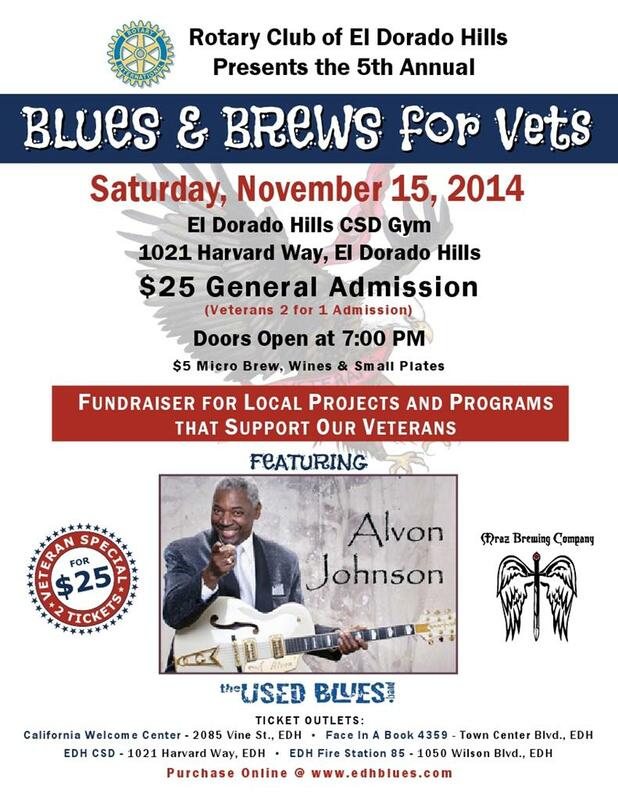 Blues and Brews for Vets is presented by The Rotary Club of El Dorado Hills as a fundraiser for local projects and programs that support our Veterans. Headlining this year’s event is Alvon Johnson, former vocalist in the Rock and Roll Hall of Fame group The Coasters. Two time regional winner and 2005 Blues Guitar Player of the Year in the national King of the Blues contest. Alvon has released many critically acclaimed CDs and is currently nominated for 2014 Entertainer of the Year by the International Music and Entertainment Association. Plus, returning this year are two time top 20 International Blues Competition finalists The Used Blues Band. Back by popular demand is El Dorado Hills award winning brewer Mraz Brewing Company. They will be on hand with a selection of their craft beers. West Coast Events is also returning with their delicious small plate selections.